Know about credit card cash advance. Credit card cash advance refers to service provided by credit card issuers allowing cardholders to withdraw a certain cash amount. 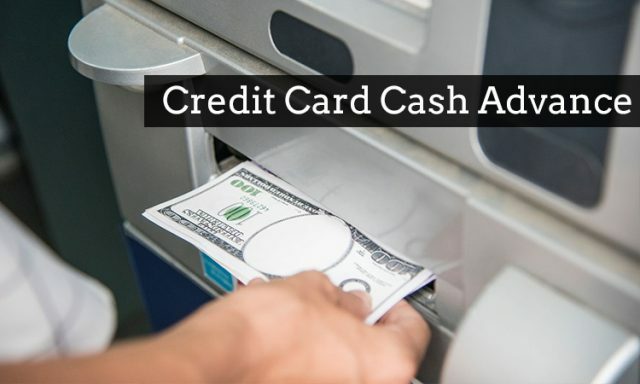 Credit card cash advance involves a steep rate of interest or fees. These do not require any prior approval and can be taken instantly. It helps give you liquid cash in hand immediately. Credit card cash advance is the most popular type of borrowing on a line of credit through a credit card. It can be withdrawn at an ATM or from a cheque that is deposited or encashed at a bank. They carry a high rate of interest, higher than the regular rates and the interest starts to accrue immediately after withdrawal. Credit card cash advances can accrue a fee either at a flat rate or a percentage of the amount taken. There is also a fee on the ATM transaction that you make. Credit card cash advance carries a distinct balance from the credit purchases that you make. A monthly balance can be followed for the cash advance like the purchases that you make. Credit card cash advances do not qualify for any introductory no/low-interest offer. In case of a credit card cash advance, the credit card company is lending you money and charging it to your account. There is usually a limit to how much you can withdraw in a cash advance. However, in case of an emergency, it acts as an important source of finance. •APR is higher than credit card purchases. •Interest-free period is missing in credit card cash advances. It starts to accrue immediately and there is no grace period. Though in cases of emergency credit card cash advance comes to the rescue you must develop healthy money habits. Make purchases with your credit card and avoid any unnecessary purchase. You must monitor your balance and build an emergency fund to avoid taking any credit card cash advance. Previous articleNO MORE WORRIES GET INSTANT LOANS ONLINE!! Next articleFinding the Right Credit Card for You!